Diana of the Chase, 1922. Collection New York Historical Society. Anna Hyatt Huntington (1876–1973) was once among New York City's most prominent sculptors. She dedicated her work to the beauty of goddesses, the romance of heroism, and the vitality of animal life, on scales ranging from medals to monumental public art. Although Huntington herself is forgotten today, her works still grace many of New York's outdoor spaces: Central Park, Riverside Park, the Bronx Zoo, the Hall of Fame for Great Americans on the grounds of Bronx Community College, and the Lamont-Doherty Earth Observatory, Columbia University, Palisades. They are prominently displayed in the permanent collections of many of the city's great institutions including the Metropolitan Museum of Art, National Academy of Design, New-York Historical Society, the Hispanic Society of America, Cathedral of St. John the Divine, Columbia University, and many others. 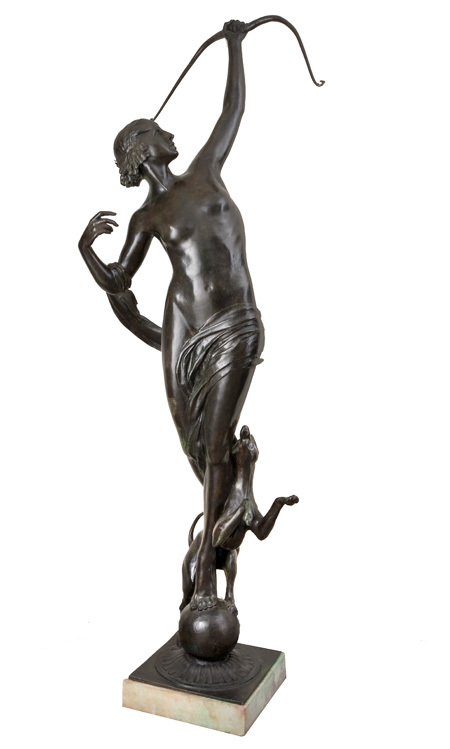 At a time when very few women were successful sculptors, Hyatt developed a prolific career. She exhibited often, traveled, received critical acclaim at home and abroad, won awards and commissions, and positioned her work in parks and institutions. In the midst of this success, in 1923, she wed the great American philanthropist Archer Milton Huntington. Anna Hyatt Huntington's early work is of particular note and is the focus of this exhibition. Alter egos, including a surging Diana of the Chase and an assertive Joan of Arc on horseback, are complemented by a diverse range of playful and mighty animal sculptures that convey Hyatt's pioneering vision. This presentation is comprised of 14 life-like bronze creatures, ranging from fierce jaguars and monkeys to gamboling greyhounds and flocking cranes. A life-size Diana of the Chase and various versions of Joan of Arc, including innovative, 360-degree rotational object photography that allows visitors to circle and inspect the 1915 Riverside Drive Joan of Arc, are included. Additionally, medals, plaques, body casts, and a film of the artist at work are on display along with other vintage ephemeral materials that allow viewers to understand the artist's fine skills as well as her dedication and laborious process. A century after most of this work was made, the time is ripe for the renewal of this pioneering American sculptor's reputation. Goddess, Heroine, Beast: Anna Hyatt Huntington's New York Sculpture, 1902–1936 is organized by Anne Higonnet, Ann Whitney Olin Professor of Art History at Barnard College and Columbia University, in collaboration with Kitty Dare and a class of twenty PhD, MA, and BA students from both Barnard and Columbia (Morgan Albahary, Caitlin Beach, Margot Bernstein, Yoon Jin Cha, Sonia Coman, Celia Durkin, Kofoworola Eke, Lidia Ferrara, Daria Foner, Lisa Heller, Victoria Jones, Katherine Lauricella, Sarah Lipman, Daniel Ralston, Lauren Robbins, Mary Lib Schmidt, Ben Swetland, Zoe Flood Tardino, Ellen Watkins, and Julia Wolkoff), in collaboration with The Media Center for Art History, Department of Art History and Archaeology, Columbia University. In conjunction with the exhibition the gallery is publishing a fully illustrated 48-page catalogue and an indepth website scheduled to launch with the opening of the exhibition. Saturday, February 1, 2014, 10:30 a.m. to 12:30 p.m.
Friday, February 21, 2014, 10:30 a.m. to 12:30 p.m.
Anna Hyatt Huntington's animal sculptures are entrancing and the number and variety available in the exhibition provide us with a veritable zoo of sculpture! Families are invited to come to the Wallach Gallery to enjoy a day of fun, learning, and art. Participate in a tour of the animal sculptures and learn a little bit about Anna Hyatt Huntington's close connection to these creatures. Engage with the sculptures through storytelling, observation, and your own drawings and then use what you have learned to create your own animal creation! Bond through learning and creating art in an environment that is appropriate and fun for all ages. Friday, February 7, 4 p.m.
Tour the exhibition with the exhibition curator, Professor Anne Higonnet, followed by a lecture by Robin Salmon, Curator of Sculpture at Brookgreen Gardens, S.C.: "The Life and Art of Anna Hyatt Huntington." This exhibition is made possible by an endowment from The Miriam and Ira D. Wallach Art Gallery. We are grateful to an exceptional, anonymous benefactor whose generosity made the catalogue possible. Two additional anonymous donors supported particular aspects of the project. Finally, we are appreciative of subventions from Barnard College.